The U.S. atomic destruction of 140,000 people at Hiroshima and 70,000 at Nagasaki was never “necessary” because Japan was already smashed, no land invasion was needed and Japan was suing for peace. The official myth that “the bombs saved lives” by hurrying Japan’s surrender can no longer be believed except by those who love to be fooled. Photos of the atomized cities that did reach the public merely showed burned buildings or mushroom clouds — rarely human victims. I have long known that the usage of that Uranium powered device on Hiroshima was absolutely unnecessary and that Japan was already a beaten nation and absolutely willing to surrender to the United States... Japan was already being bombed day and night by B29's operating out of bases in both the Marianas and China, and their industrial and manufacturing facilities were collapsing... Worse, due to the incessant bombing there was fear of famine and massive starvation for its 90+ million wartime inhabitants... The Japanese government knew the "jig was up" and had been approaching the US, through neutral nations, wanting to surrender since the beginning of 1945. The reality is that the Konoye cabinet in Tokyo had already informed the United States government of its acceptance of every single term as laid out in the US surrender demands with the one request that the Japanese be able to keep their Emperor, Hirohito, as their head of state in a post-war Japan..... 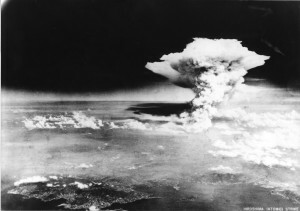 It is not surprising and in some ways very barbaric that the US purposely delayed the surrender of Japan just so they could drop these two atomic bombs on Hiroshima and Nagasaki, and then have the audacity to agree to the exact terms that the Japanese had requested 5 days after the Nagasaki bombing, on August 14th 1945! Now with the world again on the verge of a new global war based on lies, history's lessons are forgotten... As I and others have always said: "If we do not learn from history, then we are doomed to repeat it". Nagasaki and Hiroshima were the two cities in Japan with the highest number of Japanese Catholics. Catholicism in Japan which had survived two hundred years of persecution and had survived without priests, churches or the sacraments, was almost completely wiped out by the bombing of these two cities by the jewish/anglo-american alliance. These cities were not random targets.catholicism in Japan has a fascinating history which is virtually unknown. More should be done to publicise the allied bombing of defenceless German citizens at Dresden. That was a literal holocaust. The second world war was supposed to be a "good war"!